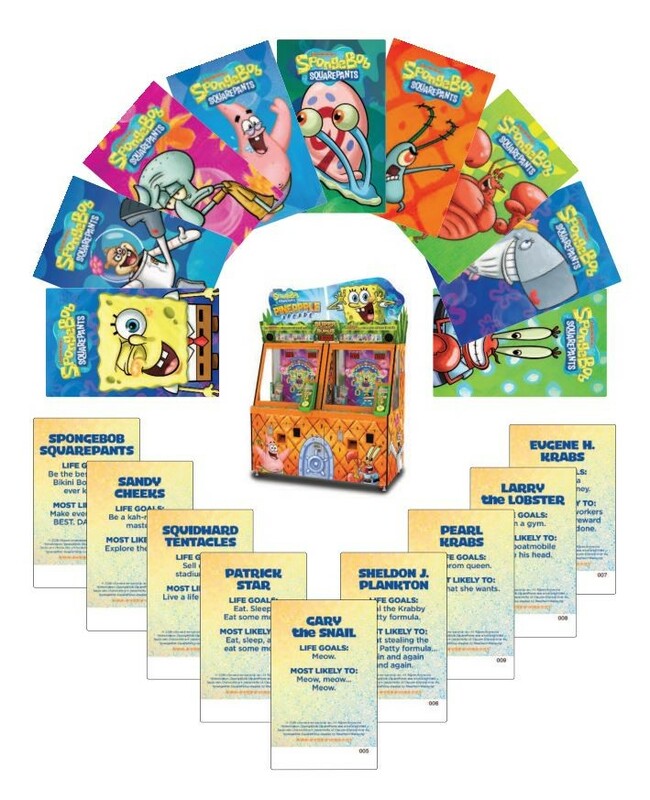 First released in 2015, the Spongebob Pineapple Arcade card & ticket redemption game by Andamiro USA has been one of the hottest and most influential games on the amusement market. As the game enters into it’s fourth year, Andamiro is preparing to infuse the game with more life by launching the 2nd series of collectible cards! As shown with this image above, the set focuses on those lovable Spongebob characters, while telling the winner what the character’s Life Goals are and what they are “most likely to” do. Collectors and operators don’t need to worry – Series 2 cards can be mixed into the same game as Series 1 cards, both still maintaining their values for tickets. The new series has different rarities however, with Gary The Snail being the most difficult to come across. Players can keep these cards, or redeem them for tickets at their preferred location. This is also made easy with Andamiro’s new Redeem Machine, which is fully compatible with both card sets.